An amazing duo who just wouldn’t give up! I carried my limp, terrified, starving 80 lb. dog around San Francisco for a week after our trip to the emergency room, looking for answers, before I met a neurologist at SF Veterinary Specialists by the name of Dr. Tracy Sutton. I walked into the exam room to find Dr. Sutton and her assistants smiling and playing with Scout. There was a noticeable shift in Scout's energy; they had distracted him from his anxiety. He was even accepting treats. I noticed a shift in my energy at the sign of his comfort. It was really instructive to watch. Dr. Sutton told me nonchalantly, "It could be a couple of different things, but my best guess is Coonhound Syndrome." She explained, that the saliva of a raccoon can cause complete paralysis in dogs. It was a relief just to have some semblance of a prognosis. But most importantly, she told me there was a high probability Scout would make a full recovery. She wanted to start running tests right way. That sounded like a path towards answers. I felt hope replace anxiety in my chest. She told me to be prepared for a tough road ahead. I thought, "After the last week I had, what could be tougher?" Turns out, it would all be that tough. Some nights we struggled, as his anxiety and paralysis caused him to have night terrors, and his inability to move made for constant discomfort. Scout and I hit rock bottom together several times. We went through some serious bouts of anxiety at first—stressed out, sleep deprived, learning to communicate. Administering different anti-anxiety pills trying to help him sleep and figuring out his rhythms. But countless people from my community showed up to help out. So many of our friends turned up to show him love and support and to help in anyway they could, often just sitting by his side and comforting him. Scout and I quickly learned, it takes a village to get through tough bouts in life. We have met such amazingly healing people along the way. I taught Scout how to accept help from others; he turned around and taught me the same lesson. A month ago, Scout started moving a little bit. Then a little more. It was subtle and slow at first. Movement started in his tail and then his hind legs and then he got more strength in his neck. I reached out to the Rex Center to figure out when I could get him in the pool. The Rex Center quickly connected me with Dr. Ilana and I came in right away to meet her. Dr Ilana was the last piece of the Scout's rehab puzzle. She showed him 110% of her attention and he showed her he had the will to get stronger. She helped Scout build himself back up step by step. They worked on yoga balls and in the underwater treadmill. We used toe straps and different harnesses. We used every type of treat imaginable to keep him interested. Soon Scout started swimming with the angels that run the pool at The Rex Center! The water therapy was the perfect compliment to his other exercises. In the pool, Scout learned to use his body as a whole again. His instincts to swim kicked in right away. I left every session with a tired, worked-out dog and a bunch of new workouts to do at home. ​Scout sat up a couple weeks ago when his front legs grew strong enough to support his weight. The next day he was standing on all four. He was walking by that afternoon. Determined to heal, Scout constantly pushed himself. Everyone around him got to witness what was possible when you want to heal. Friends had dreams of the day they'd see Scout walk again. The community all held the image of a healthy dog in their minds, to help support him. It was a long, hard, beautiful road and Scout and I are stronger now than when this all started. I am so thankful for everyone that has helped us through this experience. There are many of you! I speak for Scout as well when I say, We couldn't have done it without you! Coonhound Paralysis (also known as Acute canine polyradiculoneuropathy or polyradiculitis) is a rarely-seen inflammatory neuromuscular disorder that has been reported in a number of different dog breeds. It is called “Coonhound” paralysis because it primarily affects dogs that have been bitten or scratched or bitten by raccoons on more than one occasion. Clinically affected dogs are usually previously healthy and suddenly develop acute progressive flaccid paralysis in all 4 limbs, with absent reflexes, sometimes with facial paralysis and laryngeal weakness. These signs often develop 7-14 days after a raccoon bite or scratch, suggesting an underlying immune-mediated reaction to raccoon saliva or some other immune stimulant. We do not know for certain what causes this sudden and complete failure of the neuromuscular function. But we do know that the paralysis is what we call “lower motor neuron” in origin- which means that the spinal reflexes are absent with the exception of the paw withdrawal reflex which you normally can sometimes elicit in affected dogs with a toe pinch or tickling the paw. Some cranial nerves may also be affected and this could cause a change in bark, swallowing difficulties, and facial paralysis. However skin sensation remains intact and even seems exaggerated as some patients appear overly sensitive to touch or mild toe pinching. After 3 to 5 days of the start of the paralytic clinical signs, generalized muscle atrophy occurs due to loss of communication with the nerves and their corresponding muscles. Sadly the paralysis may last from weeks to months creating many nursing care concerns such as pressure sore formation, joint contracture (paws curling under), trouble swallowing, choking, or inhalation pneumonia, and urinary tract infections. Death can even occur if the respiratory nerves become affected! Fortunately- most affected dogs begin to improve spontaneously within 3-4 weeks, with complete recovery usually by 2 to 4 months. Dogs with severe signs and significant muscle atrophy or tendon contracture may not recover full normal function. Supportive nursing care at home is the primary treatment as most dogs can require 1-3 months before recovery of normal independent functioning. Frequent turning and changing position, assisting the dog to eliminate and to eat and drink, and sometimes anti-anxiety medications are all part of the full-time nursing care that these pups need. They simply cannot be left alone. 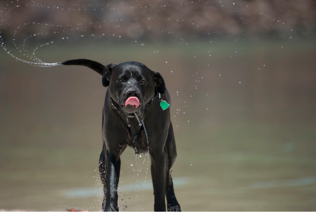 Formal Physical Rehabilitation - along with regular physical therapy at home- most definitely helps to speed up the dog's recovery and builds muscle mass back up to normal levels as soon as possible. Unfortunately relapses can occur, especially in dogs that frequently encounter raccoons. Dogs that recover from acute polyradiculoneuritis should avoid all contact with raccoons! "When I first met Scout- he was carried in and could not even lift his head or transition from lying on his side to lying with his head elevated in a sternal position on his chest. Gravity was too much for him to even lie in this position unless propped up with pillows and cushions. 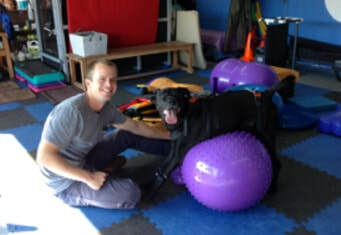 So- he started with floor exercises and worked on strengthening is core muscles and his neck luring him to do “side crunches” and try to sit up with assistance for treats! By the time he left his first visit- he could lift his head to reach for a treat from lying down and end up in a sphinx position! Since his limbs were flaccid his next goal was to work on supported standing using whatever means necessary to promote an upright weight bearing position. We started with stretching his toes and wrists so that his front feet would no longer curl under and would be prepared for weight bearing as soon as possible. We propped him up over a balance ball shaped like a peanut- and placed his paws underneath him to perform weight bearing and balance shifting exercises- luring him to look in all directions for treats. These “active range of motion” exercises stimulate muscle contractions and help rebuild muscle mass as well as with neurologic retraining. We soon found him pushing back downward with his rear legs and attempting to crawl over the peanut! This boy was really motivated to walk! Next we worked on neurologic re-training to try to pattern his feet. Using a full Help Em Up harness we assisted him to try to walk and he started to try to place his rear paws on his own! He was still too weak in the front legs to walk- however- once we got him into the swimming pool- he immediately began trying to use all 4 legs to swim in a dog paddle pattern! Then once his rear legs became stronger he began maintaining a sternal position on his own- and he even started to crawl on his belly using his rear legs to push him and began to do his own weight shifting exercises! Every week that we saw Scout he was stronger and stronger. We then began assisting him with transitions from lying to sitting posture and from assisted sitting to assisted standing. Then came the magic day- where Scout pushed himself into a sitting position on his own leaning against the side of the car and tried to stand up! He was ready for assisted walking in the underwater treadmill!"